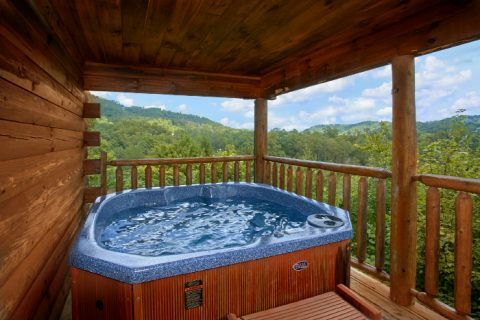 You'll find "Peek A View" nestled in the mountains near Dollywood! 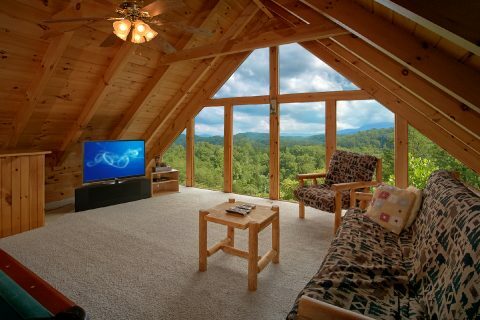 This cozy 1 bedroom honeymoon cabin in the Smoky Mountains can sleep up to 4 guests in comfort. 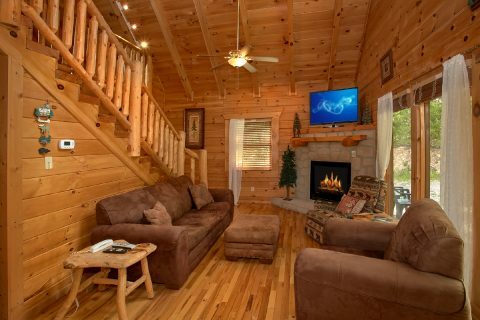 With a beautiful spot in the Smokies and great in-cabin amenities, this cabin is a great fit for couples on vacation or for a small family getaway. The main level of this cozy rental features an open floor plan that’s perfect for spending time with those who matter most. Cozy up to the gas fireplace while you watch a movie with your sweetheart. 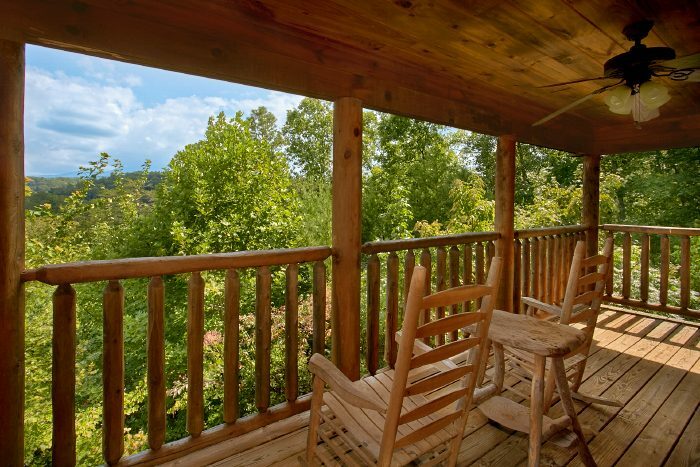 For a truly relaxing experience, step outside onto your cabin's covered deck to enjoy the sights and sounds of nature. 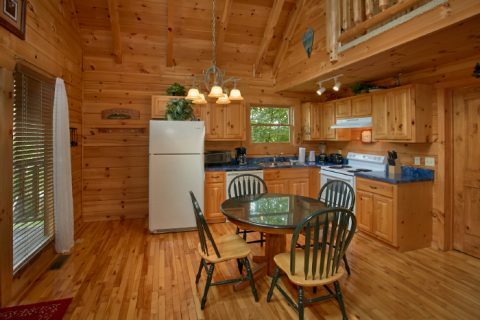 With your cabin's prime location, you can enjoy peace and privacy on the deck while you soak in the hot tub or sit in a rocking chair. 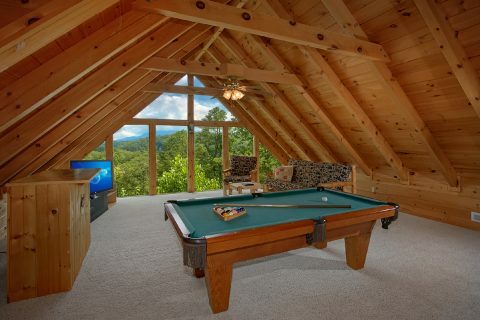 Upstairs, you can enjoy some friendly competition in the game room with a full-size pool table. Thanks to large windows, you can work on your pool shot with a beautiful view for your backdrop. This room also features a 52" television and sitting area for watching your favorite shows while you play. 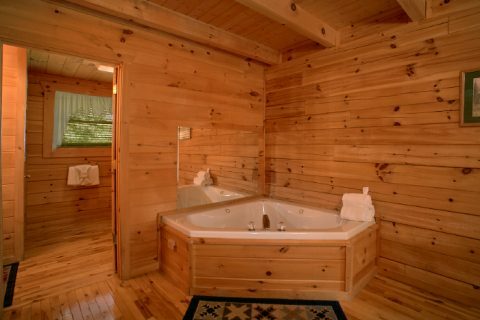 In your cabin's bedroom, you'll enjoy a luxurious king-size log-frame bed, a romantic jetted jacuzzi tub, and a private television for romantic evenings in your cabin. This rental also offers practical features like a full kitchen to make your stay both comfortable and easy. For grilling out in the summer, your cabin boasts a grill so you can host a laid-back cookout. 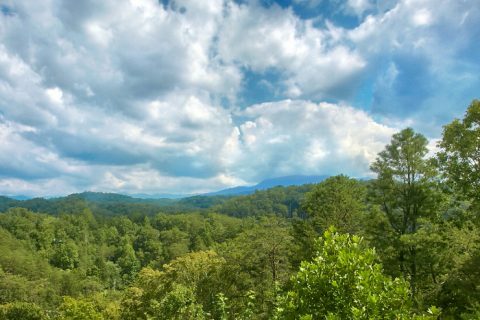 When you aren't relaxing at your log cabin with a mountain view, you'll have plenty of great attractions to explore nearby. 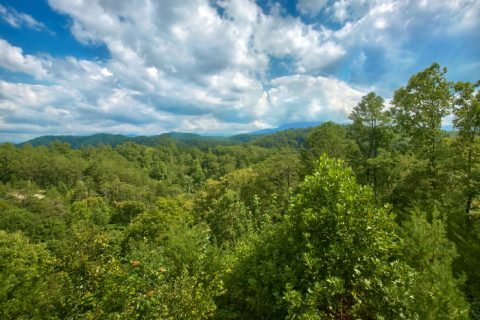 From Dollywood to the Great Smoky Mountains National Park, there's so much to do and see only minutes away from "Peek A View." 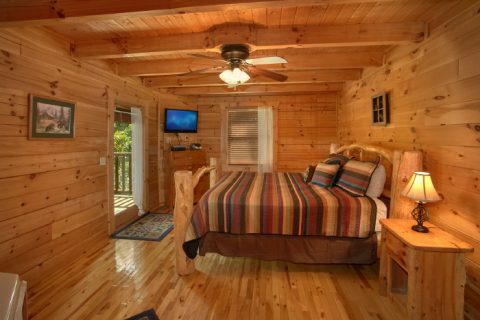 Don't forget to book online with Cabins USA Gatlinburg to earn a special discount on your stay!